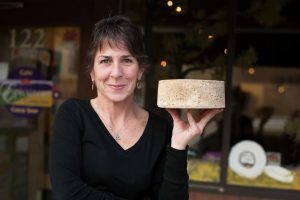 The CVM Store is proud to announce that we have paired with award winning cheese maker Sheana Davis from the Epicurean Connection to offer classes and cheese making supplies such as cultures, molds, cheese cloth, and additional supplies. Sheana Davis breaks down the barriers to cheesemaking, making it accessible, easy and fun with her energetic and hands-on class. Upon arrival, guests are welcomed with locally crafted wine and an artisanal cheese tasting, allowing participants to explore different types of handcrafted cheeses prior to creating their own. Class Cost is $40.00 per person including wine tasting. Class is limited to 15 people. Call the CVM-Store, 707-938-7917 to reserve your spot. Friday May 3rd, 1-3 pm: Cinco De Mayo Celebration! Oaxacan Cheese With Jalapenos! Ole! Friday June 7th, 1-3 pm: Getting Ready for the Fourth of July! Friday July 5th, 1-3 pm: Celebrating the Taste of Summer! Friday August 2nd, 1-3 pm: Tomato Harvest! Friday September 6th, 1-3 pm: Harvest Welcome! Friday October 4th, 1-3 pm: OctoberFest at Cook's! Friday November 1st, 1-3 pm: Thanksgiving Ideas! Friday December 6th, 1-3 pm: Holiday Celebration! Cheese classes are the first Friday of each month. Everything you need to make cheese at home including cultures, molds, cheese cloths and cheese supplies are available to purchase at The CVM Store. Class cost is $40.00 including wine and cheese tasting.